Bigfoot News | Bigfoot Lunch Club: 95% Certainty and Indisputable Proof? At Cryptomundo Loren Coleman is quick to tone down the rhetoric coming from the Seberian Yeti Expedition. "...while “evidence” might have been collected, there was not “indisputable proof” gained. No DNA analysis has been conducted. No results have been confirmed or published. One clump of moss said to be a bed, supposedly. Sorry, such a rush to make a sensational media splash is not even good hominology among my Russian colleagues." You can read below where Mr. Coleman tells the Huffington Post, "These are not 'proof' that would hold up, zoologically,"
Has it finally happened? Did scientists find real evidence of the existence of a hairy bipedal creature known as the Siberian Snowman or Siberian Yeti? Researchers are claiming they are 95 percent sure that the fabled Russian version of the Abominable Snowman or Bigfoot lives in the Kemerovo region of Siberia. It didn't take very long for them to issue a statement on the official Kemerovo website stating they had found "footprints, a probable den and various markers that Yetis mark their territory with." An English translation (from translate.google.com) of the original Russian news report added that the conference researchers "collected irrefutable evidence of the existence of the Yeti in Mountainous Shoria" (the southern part of Kemerovo). 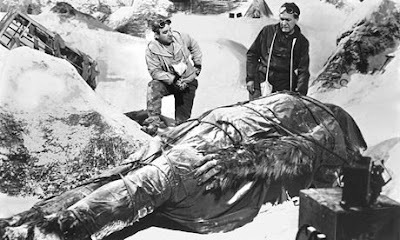 They concluded that the artifacts gave them 95-percent proof of the existence of Yeti in the Kemerovo region, the press release stated. Some possible Yeti hair samples reportedly found in the region by Russian scientist Anatoly Fokin will be studied in a laboratory to determine their origin. "This does not seem to be any more than what you hear about from weekend excursions in North America that go out, discovering some hair of undetermined origin, calling it 'Bigfoot hair,' then locating some broken branches and piled trees, saying it was made by Bigfoot, and finding footprints that look like Sasquatch tracks," said Loren Coleman, director of the International Cryptozoology Museum in Portland, Maine. "These are not 'proof' that would hold up, zoologically," Coleman told The Huffington Post. It's not the first time this year that alleged Bigfoot (aka Sasquatch) "evidence" has come under scrutiny. Back in June, creature researchers in California held a press conference soliciting help to get a DNA test that might determine if Bigfoot left physical impressions on the windows of a pickup truck in the Sierra National Forest. So far, the jury is still out on that case. Skeptics point out that the area of Siberia that's allegedly home to the local Yeti legend helps promote tourism. In fact, opening day of the ski season there is known as Day of the Yeti -- an attempt to sell many Yeti-related souvenirs and bring in more skiers to the region. While scientific researchers continue hunting for signs of a Yeti lair in Kemerovo, let's hope they don't discover a cave that contains a set of recently purchased touristy Yeti beverage mugs. 50% discount at salons to begin with at first, then a possible 20% increase after 6 months, a buy one - get one free on breakfast pancakes, and Nike need to get on this. I'm sure a few more people will have more well thought out ideas.